"AWESOME service! The staff on the phone, as well as the repair staff (George) we very helpful! They actually called me 30 minutes ahead of time and then showed up on time to the appointment , were affordable, and did great work. They stretched 2 spots in my home- gave me a great deal and you can't even tell where the wrinkles are anymore! USE THIS PLACE!!" "L-O-V-E the TruRenew Team! Two kids, one naughty dog, and a husband who likes to "tinker" in the garage do not mix well with ivory colored carpeting in the family room. I needed a general carpet cleaning and they were able to come over just prior to the holidays. Not only did they do a great job on the general carpets, they even removed some darker marks that had been there for over a year! Super professional, no disgusting chemicals, and what they quoted is what I paid." "I was very impressed with the quality of work that George did on my hard wood floors. I recently purchased a new home that had years of wax and polish build up. I got three estimates including Trurenew. One estimate was double the estimate from George and the other company refused to attempt to remove the wax buildup. Trurenew arrived and finished on time. I would recommend them to anyone wanting quality work at honest prices." "Professional, fast but not rushed, and so kind! Seriously good hearts that shine through just like the tile! I was seriously concerned the carpet wouldn't come clean but it was just like new when Brett finished! Definitely money well spent, and I'll always make TruRenew my only call for cleaning! (You should, too.)" "Amazing prices and it worked! My carpets that I thought was going to have to be replaced were like new after the cleaning. Very impressive!" 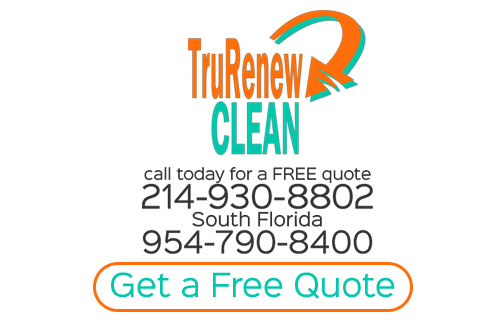 "I called Trurenew clean because my usual company could not get out a rust spot from my filing cabinet. When I called, Tracy said she was confident they could make it better.. They were able to come out the next day luckily because my house was going on the market the next day. They were able to get the stain out and my carpets have never looked this good after cleaning!!!! Thanks guys"
"I am so impressed with how clean they were able to ge to my carpets. Scheduling was a breeze, price was extremely fair (I think they had a special) and then the completed product. Thanks guys!" "Unbelievable!!!! I have had 3 companies come out to tell me that my wood floor was ruined because it was engineered hardwood and could not be sanded and refinished. My last quote was from TruRenew. Apparently my previous carpet cleaner who said he did wood floors applied a "wood floor finish" that was wax. When George came out he showed me that he could remove the wax and make my floor look new and delivered on his promise. Don't trust anyone before you call these guys!! Great work keep it up and thank you!!" "Nicest most professional guys I've ever hired! 4. Masterful cleaning in one hour- I was delighted! 5. He noticed dirt underneath my rug and did a complementary vacuum! Most importantly, I felt very safe with George in my home. I definitely support and recommend this business!!!" "I contacted multiple companies to clean my 1940 brick custom white washed floors. George and Jenn with TruRenew Clean was the only company that was able to give come to my home and give me a quote and show me how the process was going to work. I had a lot of concern and did not want the white washed removed, just the dirt. George and Jenn spent hours hand cleaning each grout line just to make sure that my floors and the finish were not damaged. As a result, my brick floors look new and just as beautiful as a remember them being. I am thankful to have found such an honest company and people"
"I called TruRenew to have a carpet patch installed because my dog tore a hole in the carpet for the second time. The first company who installed the original patch did a horrible job, but the techs at TruRenew made the patch look flawless. I can't even tell there is a patch there. I will always continue to call your company in the future. Thanks for the great work." "George and Jennifer were unbelievably professional. I had a Great Dane that was recently ill and had urinated all over my home. I was certain that my carpets needed to be replaced. George showed me the damage but assured me that he would be able to take care of the odor. George explained that I had pet proof padding and that the odor and urine could be rinsed and cleaned using specially designed pet treatments. I am pleased to say they saved my floors. My home feels like a home again without the smell. THANKS AGAIN!" "I have used Zerorez for years and have never been satisfied but for lack of trying a new company always stayed with them. I am glad they could not fit me in their schedule this time. I called TruRenew and they were happy to schedule my appointment and my carpets have never looked better." "20 Years of dirt, grease and grime GONE!!!! I have scrubbed on my hands and knees cleaning my kitchen floors and I have never been able to make then sparkle like George and his wife. They were so friendly and a pleasure to have in my home. I have already referred them to my friends at church." "My pups had used my wife's closet for a restroom for sometime. We never knew where the smell was coming from because there were not really any stains. George and Jenn with TruRenew came out and located the pet urine in the closet area. We had NO IDEA how much damage these little terrors had caused. There was pee everywhere. After George and Jenn were done my wife walked into her closet and the smell was completely gone. We were amazed, we thought there was no way anyone could get that out. WAY TO GO GUYS!" "I am so thankful for the professional and honest advice that George and Jennifer gave me for my wood floors. I had been using Bona Polish on my floors for many years and they began to look terrible. I called so many companies that told me the price would be between $2.50 per square foot and up. I just could not afford that kind of price. So in a last ditch effort I called George and Jennifer, these two came out to my home, explained the process, performed a test spot for me to see, measured the areas and gave me a price. The price was well below any other company I had called. The day came for the job to be done. They showed up to my home on time, ready to work and began promptly. My floors have never been this clean since they were installed. George even left me with some simple after care tips to help with not running into the same problem again. What an excellent example of customer service! Thanks again"
"George and Jennifer came to my house to clean my bedroom and hallway. These areas were heavily stained and in desperate need of cleaning or else I was going to have to replace. WOW these two did an amazing job." "The team did a WONDERFUL JOB! My clay floors are 20 years old and now look brand new. I could not believe just how dirty my floors were. I will always call George and Jennifer back anytime I need my floors cleaned." "After my cats caused havoc in my dining room, these guys (and gal) came to my rescue. The smell was so terrible we almost could not stand to be in the home any longer. They were so professional, never complained or even grimaced at the smell. George and Jenn were very friendly and I would definitely recommend them to anyone and everyone who needs their carpet cleaned."